Origin and Habitat: Limited to few very small areas within the state of San Luis Potosí. 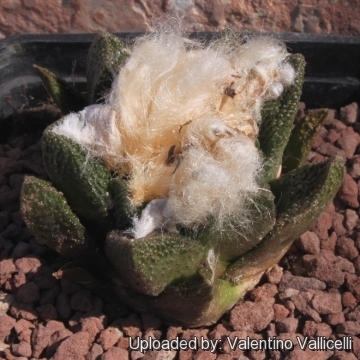 The plant was discovered accidentally in soil removed whilst extracting a specimen of a larger species by Hector Hernández of UNAM whilst collecting cacti for a herbarium project. The extent of occurrence for Ariocarpus bravoanus is about 2,000 km², the population is severely fragmented. The species population exceeds 10,000 individuals in several distinct colonies comprising more than fourteen locations. Altitude range: The species occurs at elevations raging from 1,500 to 2,000 metres above sea level. Habitat: This species grows in xerophytic shrubland on a limestone gravel plain amongst creosote bush. In the dry season the plants shrivel and almost disappear under the level of the soil. The habitat is locally classified as matorral desértico micrófilo (Rzedowski 1978). In the wild the plant is extremely endangered, and there is continuing decline due to the impacts of illegal collection, agricultural activities and other human disturbance. The type locality was systematically stripped by locals collecting the plants for sale and all the plants have been virtually collected out. Some localities are still untouched, but should collectors find these. Local people also use several ariocarpus species, including A. bravoanus, for medicinal purposes. 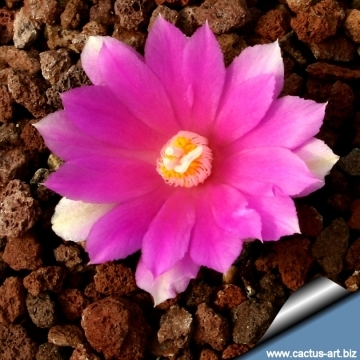 Ariocarpus hintonii (Stuppy & N.P.Taylor) hort. Ariocarpus bravoanus subs. hintonii f. monstruosa rubra hort. Ariocarpus hintonii f. monstruosa rubra hort. 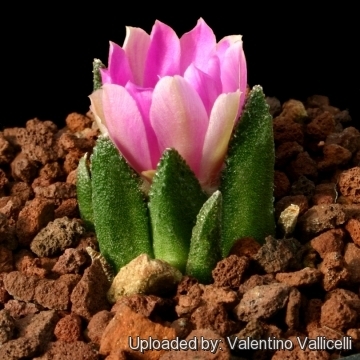 Description: Ariocarpus bravoanus is a usually solitary rosette-shaped geophyte cactus with dark green verrucese tubercles. It is accepted as a valid taxon by most cactus researchers, including Hunt (1999) and Anderson (2001). Two subspecies are recognized: subsp. bravoanus and subsp. hintonii. Stem: Subglobose, markedly depressed centrally, to 6(-8.5)cm wide, rising no more than 2.5(-3.5)cm above ground level in habitat, with an extensive mucilage system. Tubercles: Not crowded or basally compressed, adpressed in young individuals, becoming ascending, olive-green or grey-green. triangular in outline, deltate in cross section, adaxially flat but becoming conspicuously concave at maturity, usually longer than broad (to 3 7cm long and 2cm wide basally), asperous at base and irregularly papillose at apex, sometimes with the papillae forming one or two lateral furrows, sharply acute to acuminate apically, and with the edges sharply acute. Areoles: In the centre of the adaxial surface of the tubercles, 8-14mm from the tip, rounded to more or less elliptic, 2-5mm diam, woolly. Notes: Ariocarpus bravoanus clearly shows a close affinity to the previously described Ariocarpus fissuratus var. hintonii that occurs approximately 75km further north, these two probably represent extremes of the same taxon. 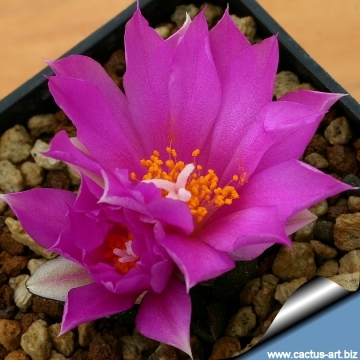 Ariocarpus bravoanus is particularly interesting as it represents a link between the former subgenera Ariocarpus with an undivided or fully divided areole and Roseocactus subgenus with the areolar fissure. 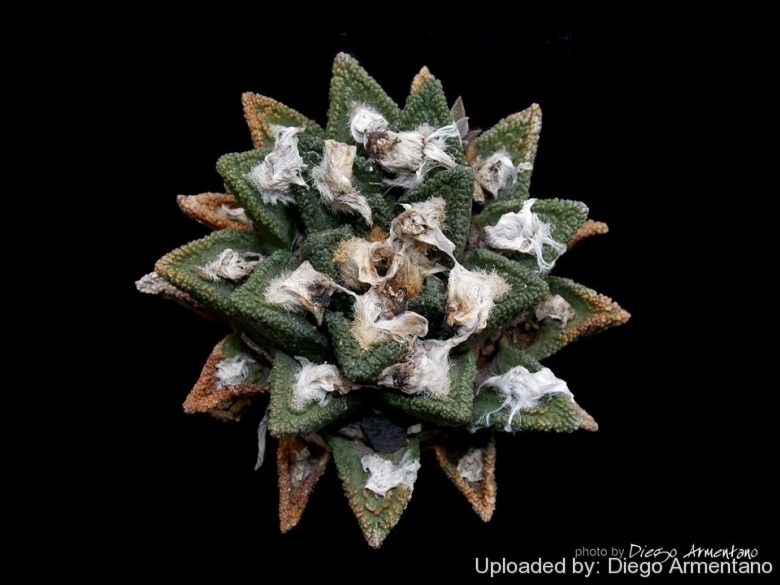 3) David R Hunt; Nigel P Taylor; Graham Charles; International Cactaceae Systematics Group. "The New Cactus Lexicon" dh books, 2006. 4) Sotomayor, M., Fitz Maurice, B, Gómez-Hinostrosa, C., Fitz Maurice, W.A., Smith, M. & Hernández, H.M. 2013. Ariocarpus bravoanus. The IUCN Red List of Threatened Species. Version 2015.1. <www.iucnredlist.org>. Downloaded on 21 June 2015. Cultivation and Propagation: Need regular water in summer but very prone to rot other times of the year, Moderate water in spring an autumn, no water in winter. Full sun, half shade.